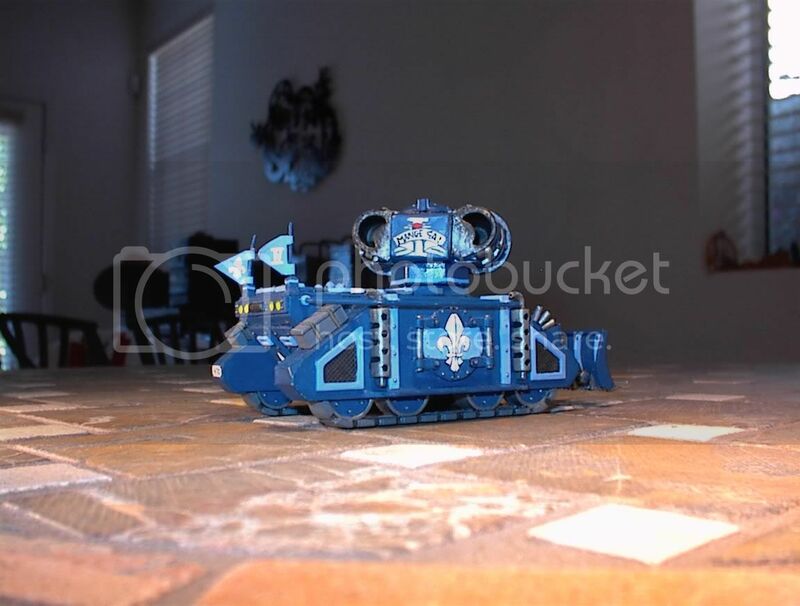 I've mostly lurked on the sisters forum, but I thought it was time I posted pictures of my army, since I just posted some of my tanks over on the finished models sub-forum. 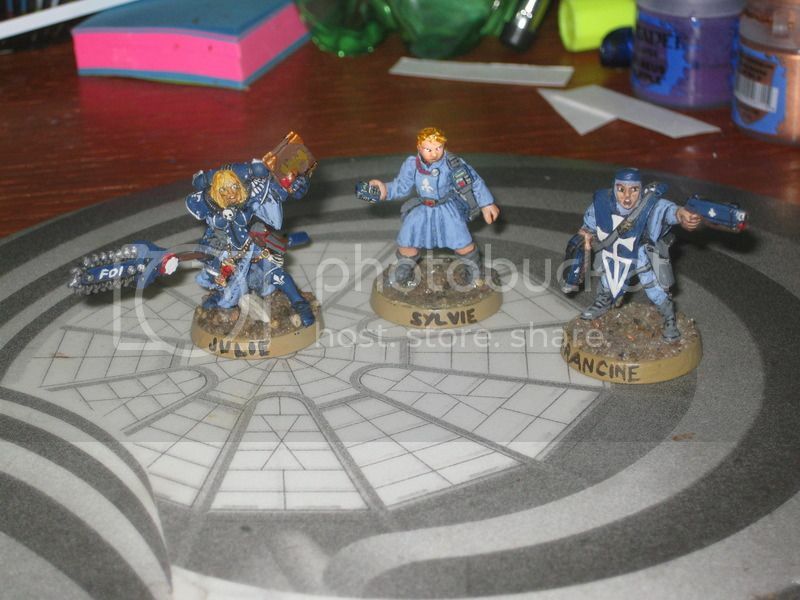 As background, I painted most of my sisters in late 2nd ed., early 3rd. ed... meaning most of them are about 15 years old, and thus kind of beat up. 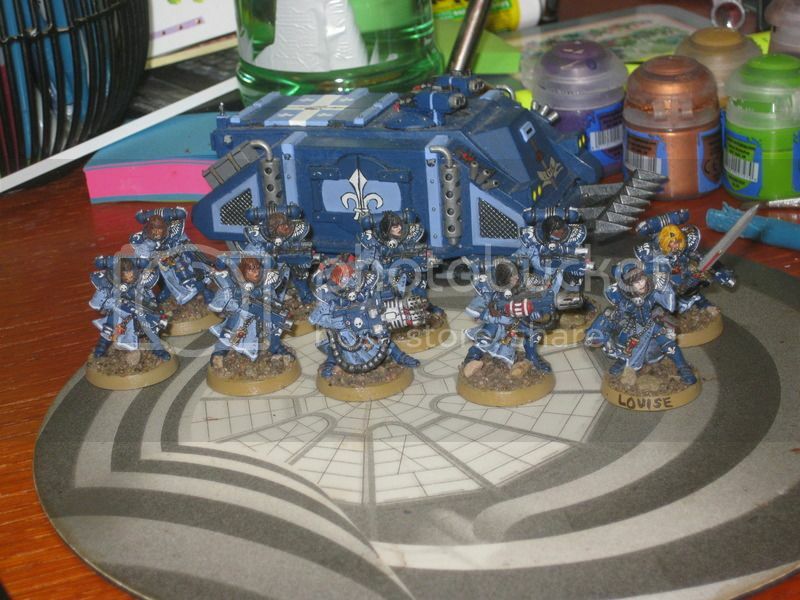 I've played across a bunch of codexes, mostly with the sisters "codex" in the back of the 3rd ed. rulebook (the worst ruleset they've had), then the rules for them that were released in WD (the "chapter approved" rules - the best ruleset for them that I played under), and finally under the witch hunters codex. I've also played a little under the most recent chapter approved rules. 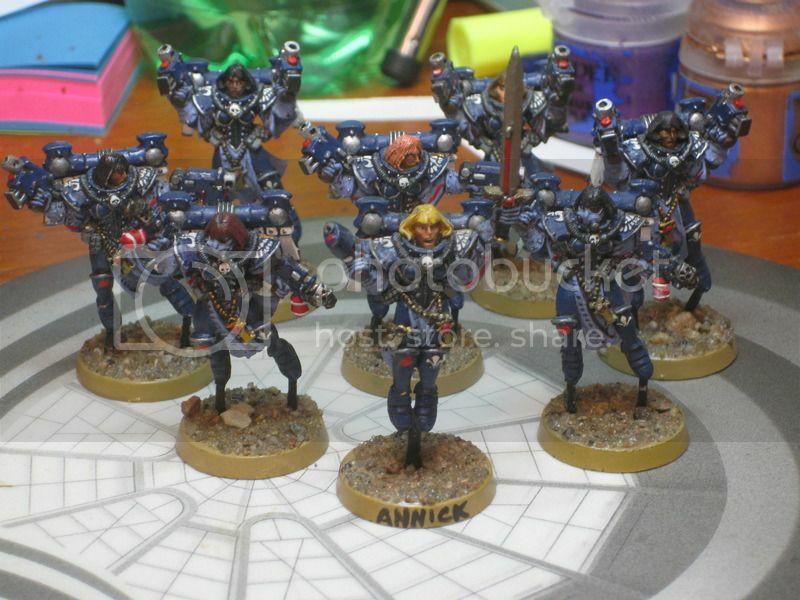 My sisters unusual colour scheme is because they were originally an order of sisters dialogus who were given militant status after arming themselves to defend against an ork incursion. They speak an unusual version of high gothic which they feel is "truer" to the language once spoken by the Emperor himself, which is why all the words used on the models are French. Here are the last the tanks. Edited by Dr_Ruminahui, 17 June 2017 - 07:35 PM. Oh wow. Blast from the past. Very nice. Edited by Beams, 17 June 2017 - 08:32 PM. Beautiful colour palette and really smooth, love it. Your Exorcists are so cool. I never even realised there was a time they had no model Love your backgroud too, really original. Also, welcome to the B&C! 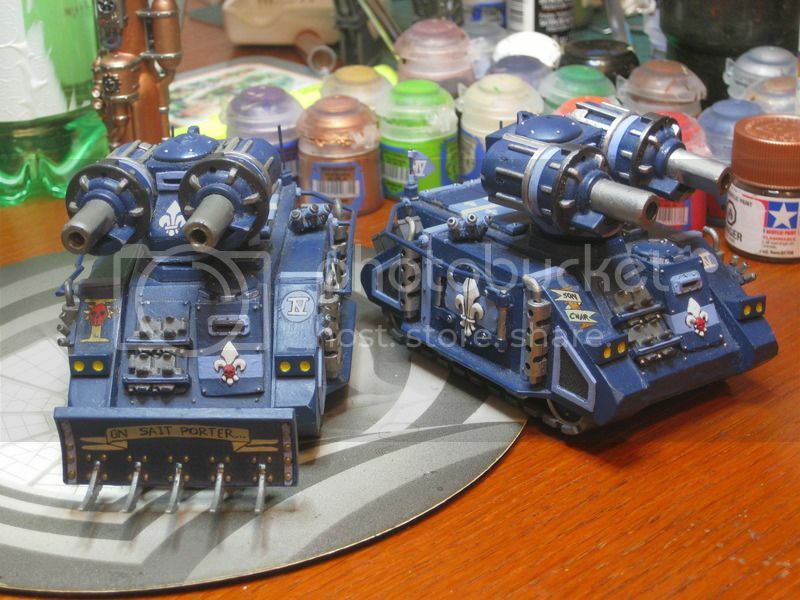 Here's your flamer and 3 barrels of the Enoeror's Holy Promethium. Wow - I'm blown away by all your comments. Thank you very much! As promised, here are some more photos of my army. My as of yet unnamed jump pack canoness. 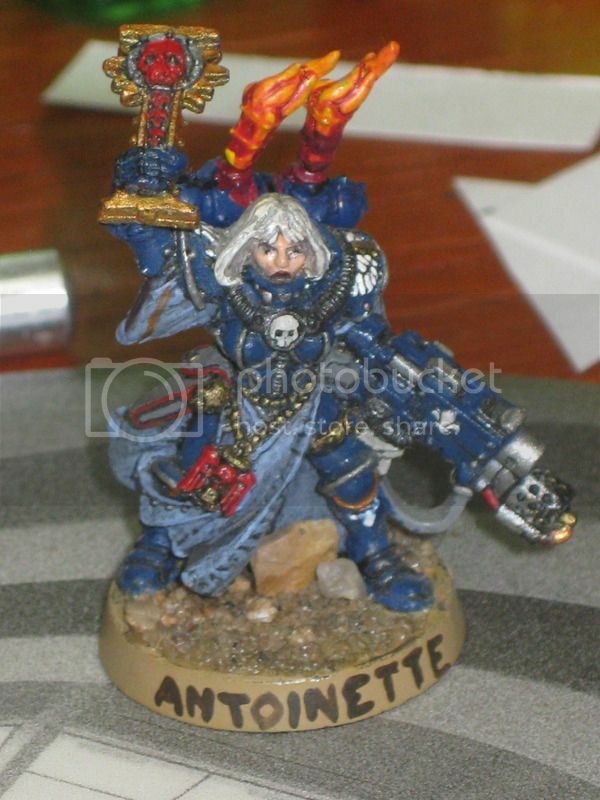 I used the old celestine model, so I sometimes fielded her as celestine. 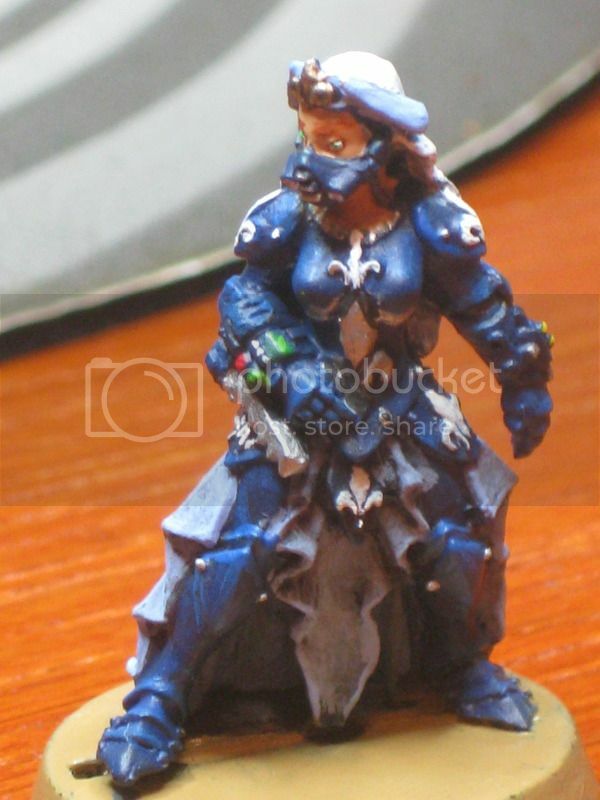 However, when I paint up the new model, I won't be doing that anymore and will have to come up with a name for her. 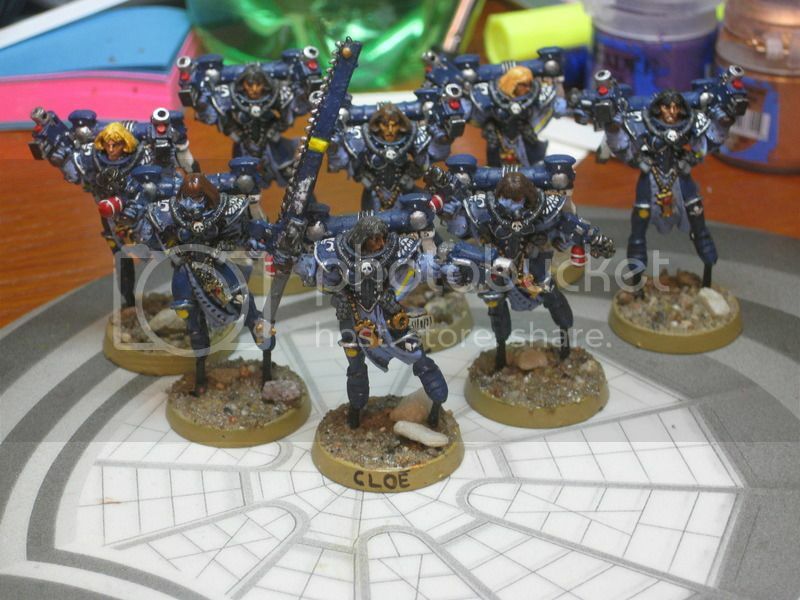 Incidentally, are jump pack canonesses legal in 8th ed? They weren't in the last WD codex. My celestine squad with their transport. 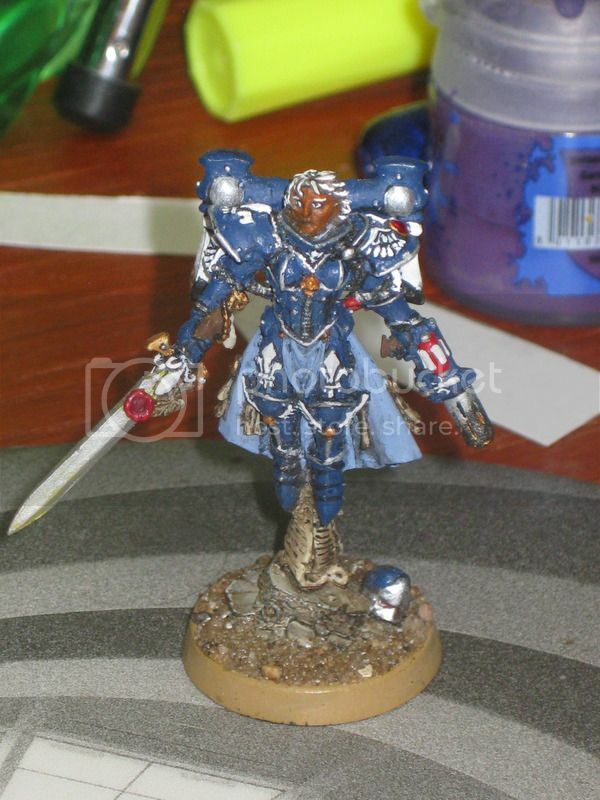 I sometimes use the squad leader Blanche as a canoness. My "sisters" repentia. 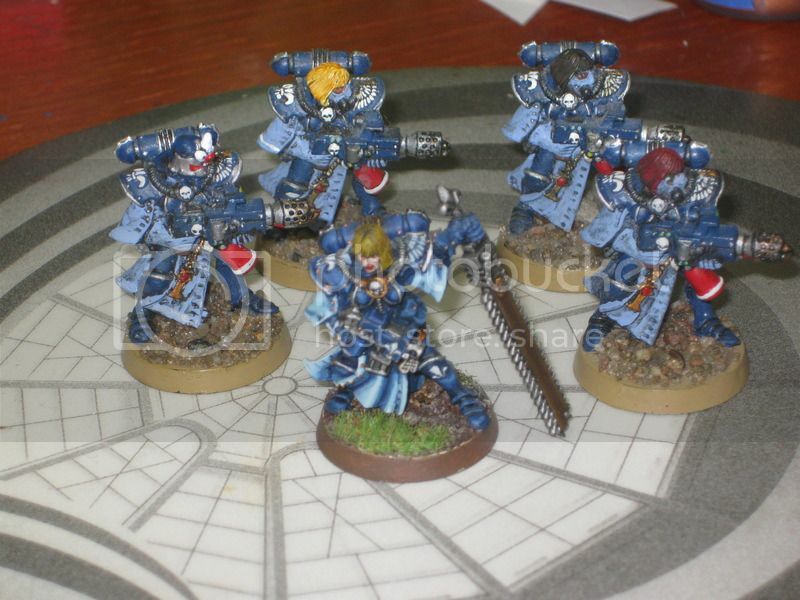 I never liked the idea (or models) of the half-clad female repentia, so I used this priests with eviscerators that I had in my old Chapter Approved militia squads. The one with the maul is my mistress... haven't been bothered to convert her yet. Seraphim squad "yellow". 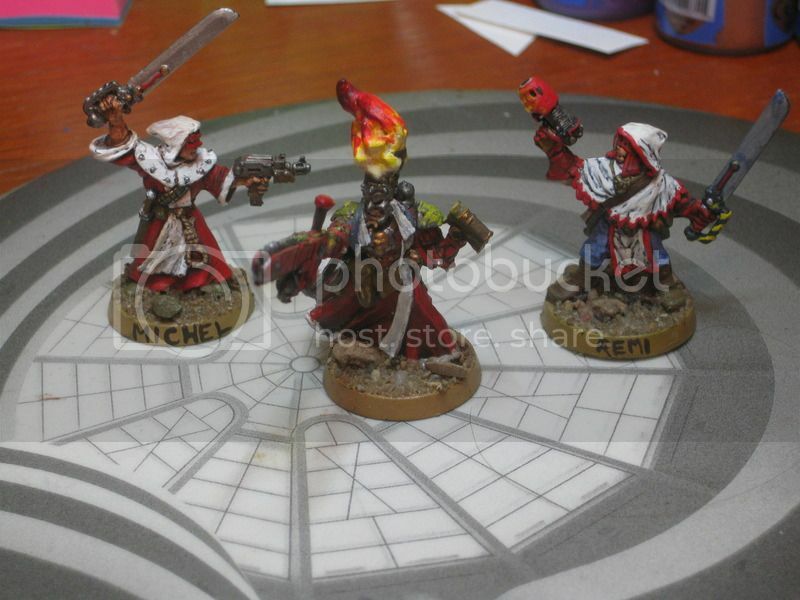 The squad leader was once converted to have a brazier of holy fire, which I more recently converted to an eviscerator. Wish I hadn't now (the eviserator conversion isn't the best) and will convert it back if I can find where I put the bits from the old conversion. My various flamers (that I took out of my troop squads to put in meltaguns), which I field as a dominion squad. The squad leader was painted by someone else, which is why it is better done and the base doesn't match. My heavy bolter retributor squad. And finally, assorted characters that I don't have a set place for - the sister with the eviscerator I sometimes made her a canoness, sometimes the squad leader of white squad. 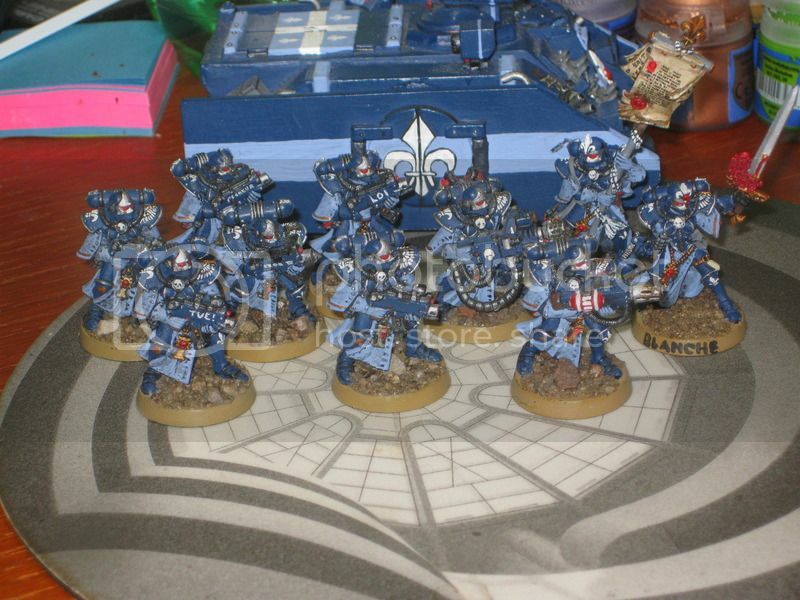 The other 2 are old Warzone figures who I may field as a hospitalier and a diagolus. Edited by Dr_Ruminahui, 18 June 2017 - 12:00 AM. 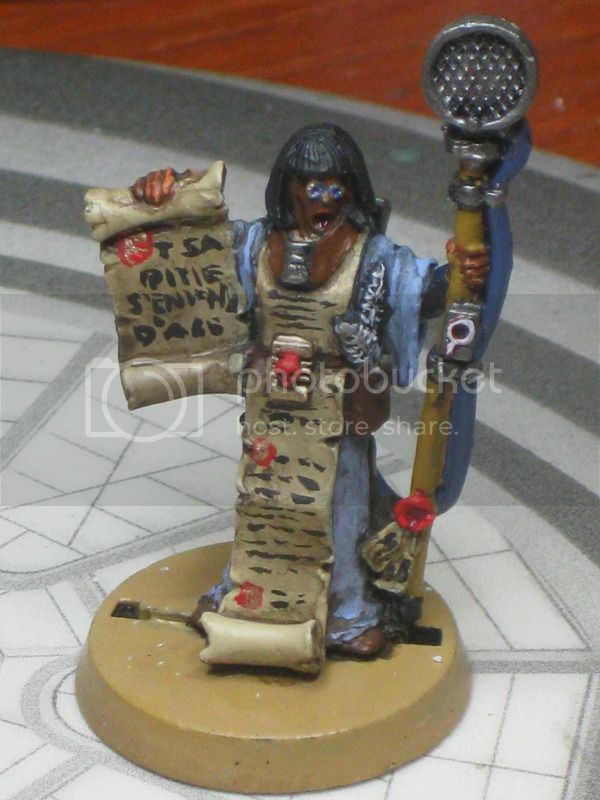 Those are some neat models Very fun conversions - I particularly like the banner. Very nice. I particularly like that banner. Well done. I like the blue armor. 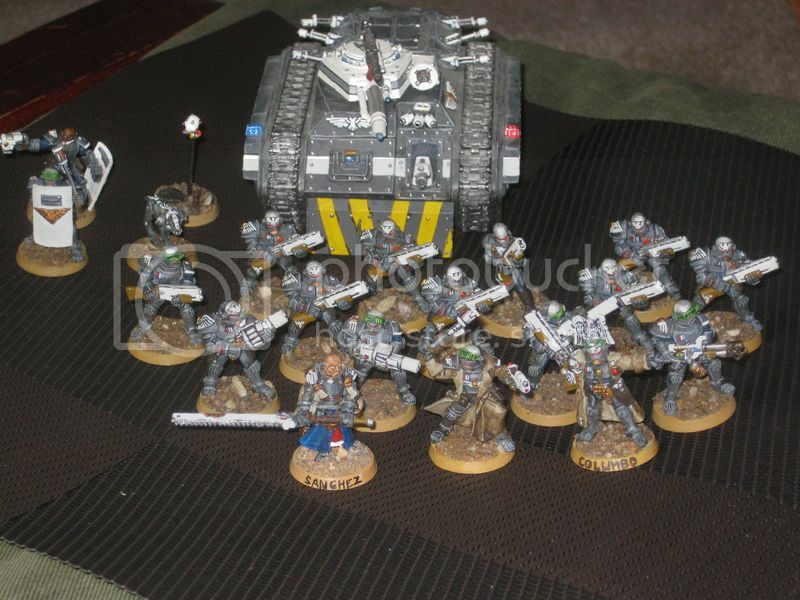 Really cool army. So much character and awesome conversions. Thanks for sharing! Thanks everyone! I'm glad you liked them. After this warm reception, I put together my Celestine and Greyfax figures and dug out my hospitalier and diagolus figures to paint. I'll be sure to post them when they are done. I'll base her when I have a bunch of models to do at once. Now working on my hospitalier. Very nice. As for that one squad leader? If you hadn't told me you didn't paint it, I would have thought you did it. Very nice. 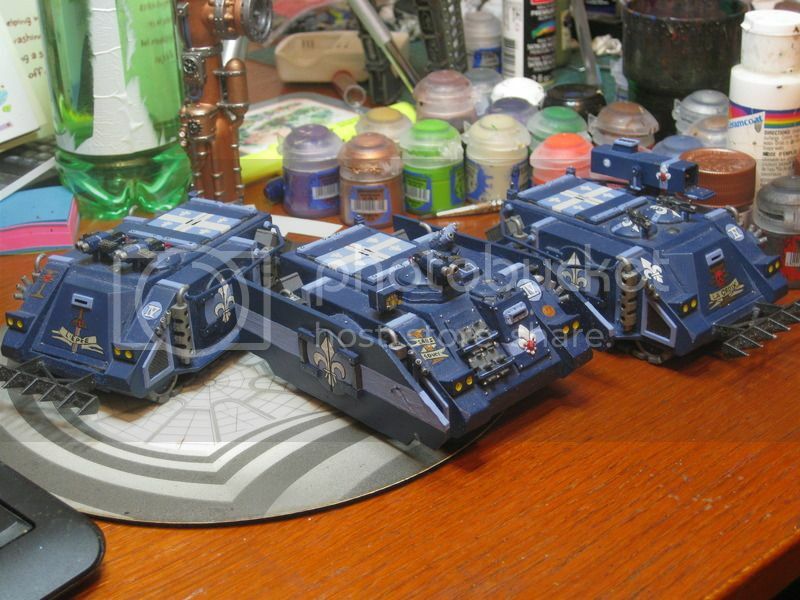 The old Rhinos looked so tiny! These are excellent! I love the fact that you've given your Sisters different skintones and hair colours. That's right up my street. Also had a bit of a giggle at "Eat this!" on the back of the Exorcist. Great use of Redemptionists and Arbites. A very well done army. You might like to hear my thought process in coming up with the colour scheme - basically, I tried the traditional colour schemes, but couldn't make them look any good. 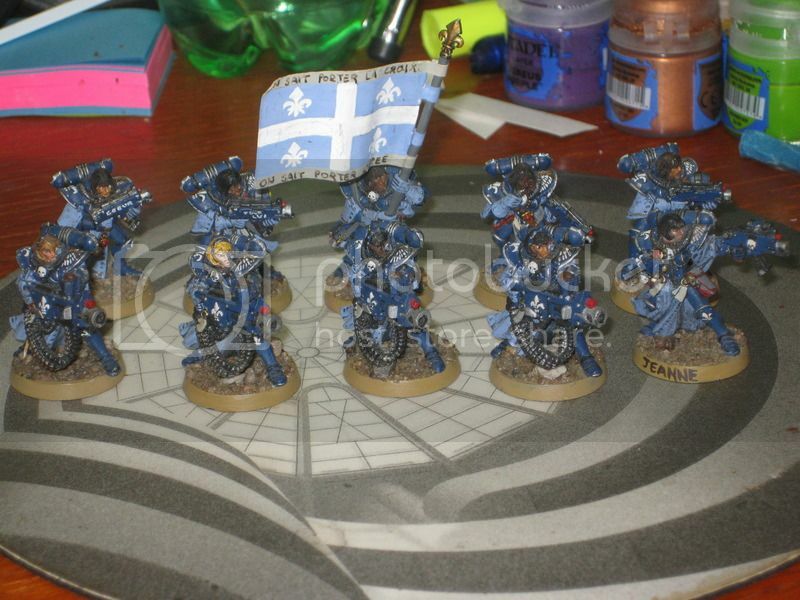 So I thought to myself about what the models said to me - and all the fleur de lis said "the Quebec flag" (Quebec is the French province in Canada - https://en.wikipedia.org/wiki/Quebec). 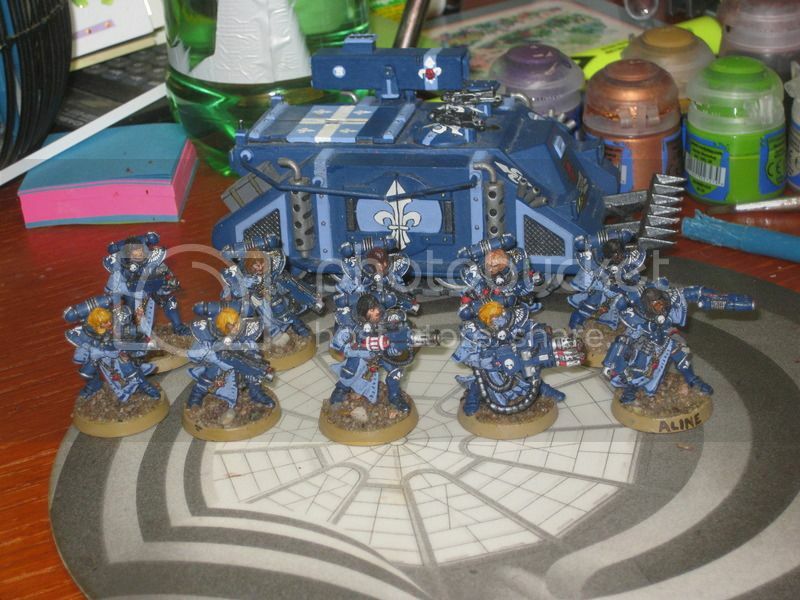 So, that's how I ended up with the blue colour scheme, the flag and the use of French on the models (the last was also because while I know no latin, I studied French). The writing on the banner and much of that on the tanks is from the French version of the Canadian national anthem ("On sait porter la croix, on sait porter l'epee" - litterally "we know how to carry the cross, we know how to carry the sword"... which seemed fitting). There was a certain irony involved, as at that point in time there was a strong Quebec seperatist movement. Then, many years later, I worked out a back story that supported my earlier choices. Oh, and for those who are interested in the, it's an address label that I cut some out of and then wrapped around the banner pole, then bent so that it wasn't sticking up at an angle. As for why it reminds you of the musketeers - the Quebec flag is based on an old regimental flag from a period about a 100 years after the musketeers, so not suprising there are strong similarities. As for the conversions, while I am okay with limited poses for the rank and file, I don't like my characters (so, squad leaders and above). They really are pretty simple - just weapon swaps for the most part. I do have one head swap - giving a closed helm to one of my meltaguns so she fits in with the rest of the celestian squad. 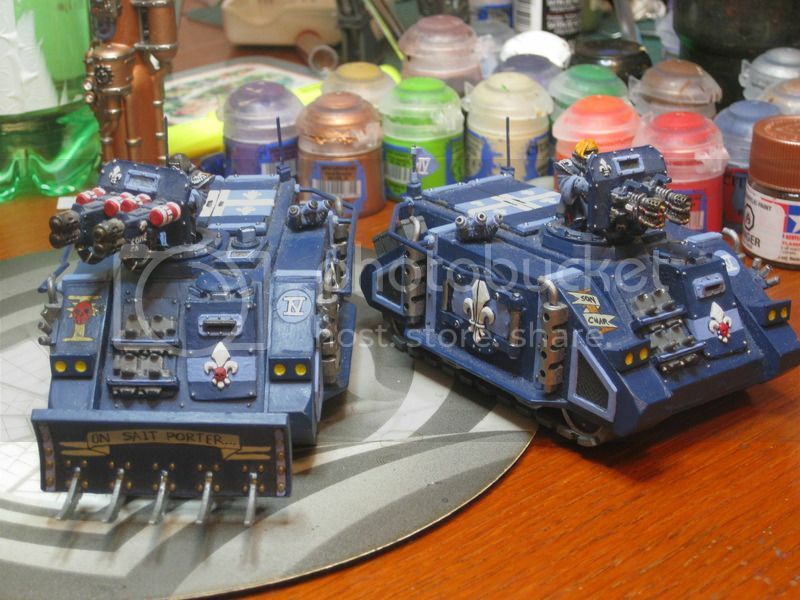 And General, I'm glad my exorcist makes you giggle - most of the French on my tanks is because it makes me smile. As for the different hair and skin tones, I did that for my guard too - after painting models all the same, it breaks the monotony to finally have something I can do differently on each model. Plus, I'm a strong supporter of diverse, multi-cultural societies and immigration. Okay, finished my hospitalier - I'm really happy with her. Good job. The Hospitaller looks great. 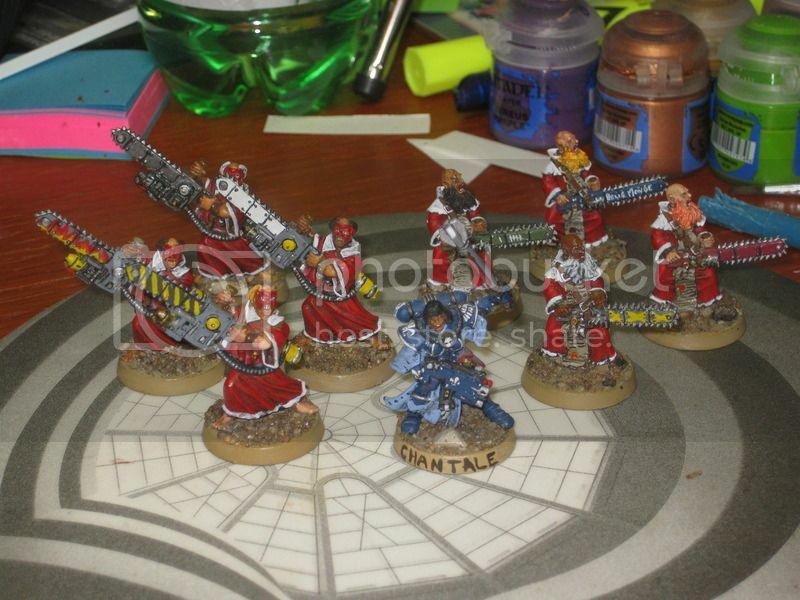 I do like the Hospitaller model.